Here's our complete guide to the Rathalos in Monster Hunter World, including how you can find and track the creature. The Rathalos is definitely one of the stronger creatures in all of Monster Hunter World, and that's saying something. In our Monster Hunter World Rathalos guide, we'll be walking you through everything you need to know about the beast. But if you instead needed anything else on Monster Hunter World, including how to safely capture any monster in the game, as well as how to quickly hunt down monsters using the Scout Flies, head over to our Monster Hunter World guides walkthrough hub. Rathalos is one of the most powerful monsters you can possibly encounter in Monster Hunter World, and you’ll want to bring your very best weapons to bear against it. It’s a quick, surprisingly agile flying beast with some deadly fire attacks, so make sure to bring armor that gives you a solid overall defense rating, as well as good protection against fire attacks. The Rathalos can move around the upper reaches of the Ancient Forest area surprisingly quickly, given that it can fly, and you can find its nest in the very top area of the entire map, where a dam is conveniently placed. You can deliver massive amounts of damage to the Rathalos if you can blow up the dam with a Barrel Bomb, and whenever it flies off around the Ancient Forest, you can always track it with footprints and gashes around the environment. As we mentioned, you’re going to want to bring armor with you that has a high defense rating, but doesn’t sacrifice any protection against fire damage. 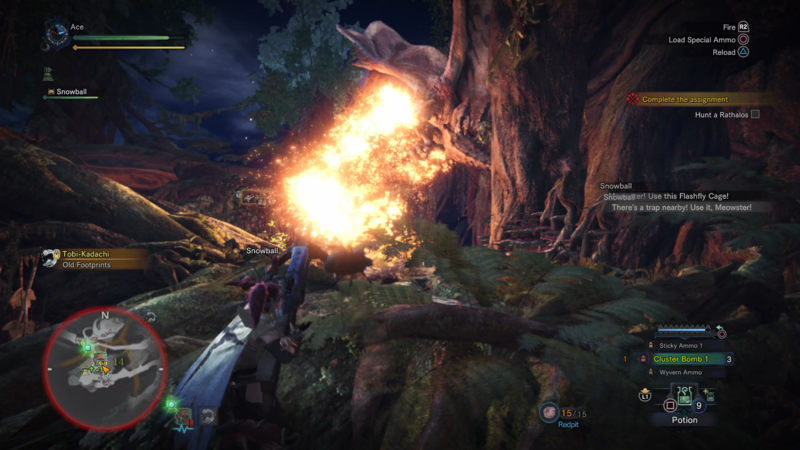 One of the Rathalos’ deadliest abilities is where it either shoots fire straight out of its mouth directly towards you, or covers the surrounding area entirely in flames. Either of these attacks can take off at least half your health, but you can tell when the Rathalos is about to pull them off by flames beginning to form inside its mouth. As for your offensive gadgets in the fight against the Rathalos, we’d highly recommend equipping the Flashfly Cage for your Palico, obtained by helping out the Ancient Forest Grimalkynes Tribe (LINK). Your Palico will now leave Flashflies around the vicinity, which you can then activate to stun the Rathalos for a short period of time. 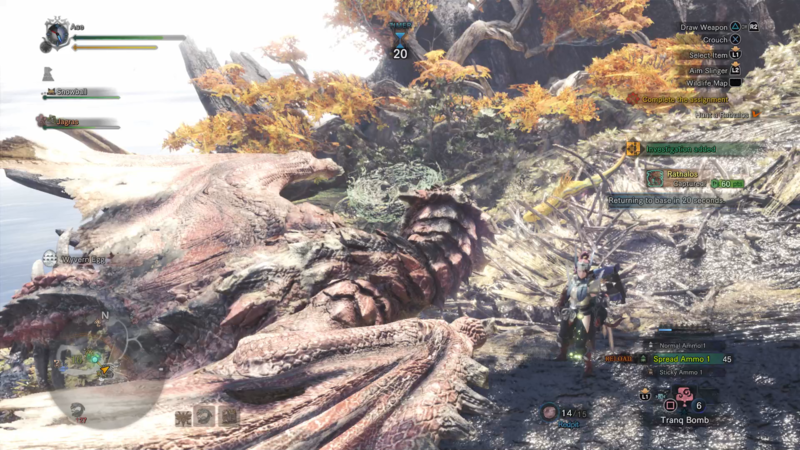 You can now lay into the monster with a few solid attacks, and we’d recommend targeting the tail, head, and claws of the Rathalos whenever you can. We’d recommend two weapons for the fight against the Rathalos in MHW: either a ranged weapon like the Bow or Bowgun, or the Dual Blades. 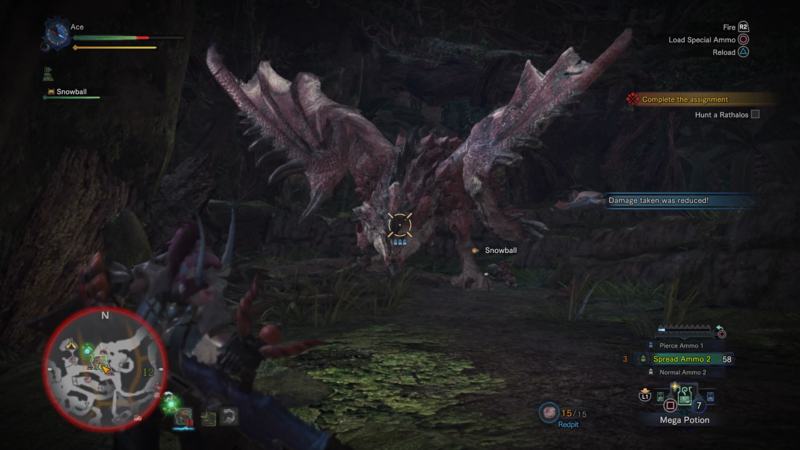 If you’re bringing a bladed weapon, make sure to target the tail of the Rathalos, as you can cut it off, taking a vital weapon for the beast out of the battle, while also giving you an extra monster part to harvest after the fight. 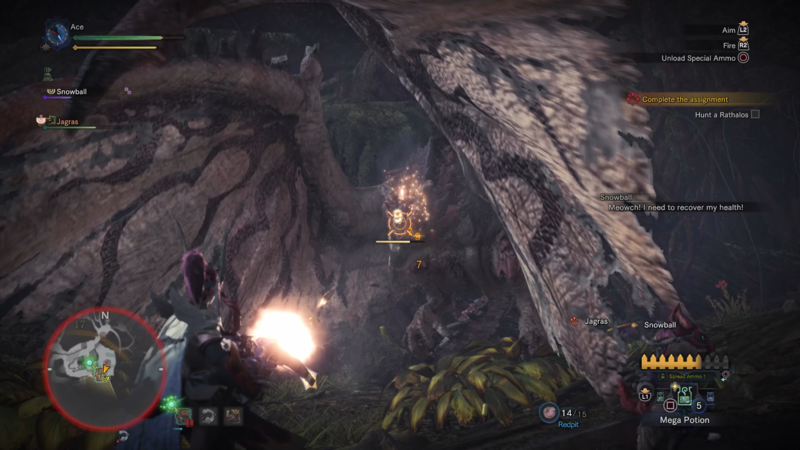 If it’s a ranged weapon that you’re equipping, we’d recommend bringing explosive ammo with you, which can easily stun the Rathalos if you manage to land a shot to its head. As for actually battling the Rathalos, you’re going to spend a lot of the fight evading the attacks of the beast. While on the ground it sticks to mostly swiping with its tail or projecting fire at you, but while in the air the Rathalos can slam itself down onto you, on top of breathing fire. But fire isn’t the only element that the Rathalos specializes in, as it can also poison you by attacking with its tail, or when it slams down on top of you from the air. You’re going to have to bring a healthy amount of Antidote potions with you to survive this battle, and in particular we’d recommend not spending too long underneath the Rathalos, as this will draw out its slamming attack which can inflict poison on you. Since it’s a fiery creature, ice attacks can devastate the Rathalos, as can electricity, able to leave the beast stunned on the ground for a short period of time. Once you’re done with the Rathalos, some nice rewards are in store for you back at the Smithy. The Rathalos armor set is undoubtedly some of the best gear in Monster Hunter World, boasting a supreme defense rating, while also providing some great protection against fire attacks, perfect for if you plan on taking down either the Rathalos again, or the powerful Anjanath. 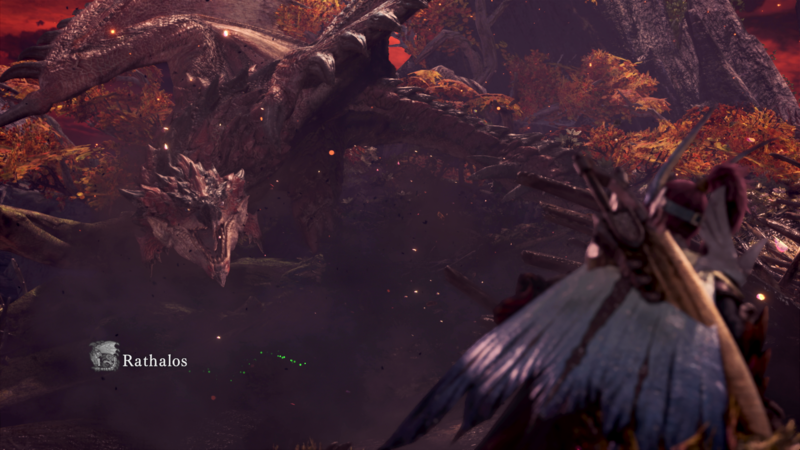 Now that we’re done with taking down the Rathalos, why not check out some of our additional Monster Hunter World guides, including our complete Coral Highlands guide, as well as our full weapons guide.